The undersigned is directed to refer to this Department’s OM. of even No. dated 7th April, 2017 revising the rate of Dearness. Allowance wet. 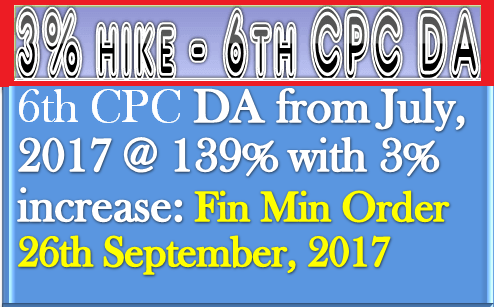 01.01.2017 in respect of employees of Central Government and Central Autonomous Bodies continuing to draw their pay in the pro-revised pay scale Grade Pay as per 6th Central Pay Commission. The rate of DA admissible to above categories of employees of Central Government and Central Autonomous Bodies shall be enhanced from the existing 136% to 139% w.e.f. 01.07.2017. The provisions contained in paras 3, 4 and 5 of this Ministry’s .O.M.No;1(3)12008-E.II(B) dated 29th August, 2008 shall continue to be applicable while regulating Dearness Allowance under these orders. The contents of this Office Memorandum may also be brought to the notice of all organisations under the administrative control of the Ministries/Departments which have adopted the Central Government scales of pay. What about rate of Da wef 1.7.17 for pensioners who continue to draw pension as per 6th CPC ?